We’ve often preached about the importance of time-saving in the mortgage industry. As a growing number of borrowers become more expectant of an immediate response, finding ways to streamline current daily processes to spend more time getting in touch with them is vital. One such way you can earn back some of that precious time is by removing the need to constantly re-enter data when pricing, but how? Let Mortech help. 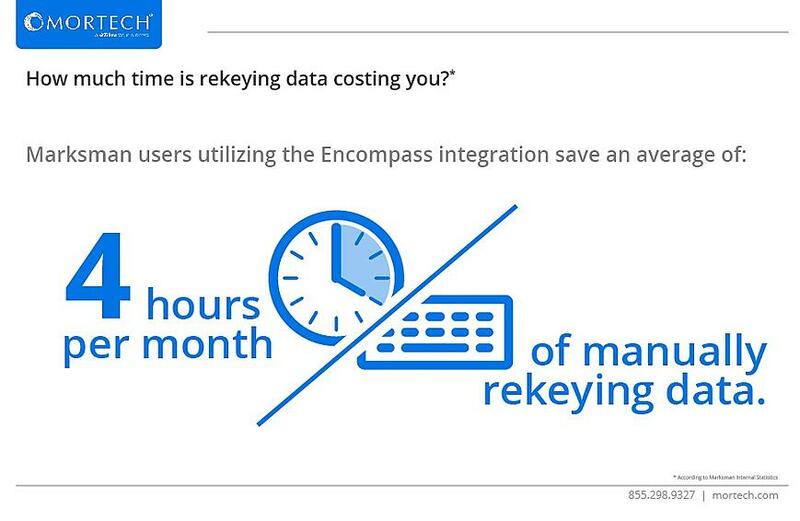 The above graphic is an example of a Marksman user that utilizes our integration Encompass’ LOS platform to save themselves from having to rekey data for a pricing scenario. By integrating our pricing engine with Encompass, a lender can input the data they need once – without having to repeat it later – and automatically transfer that scenario between Marksman and Encompass, eliminating the need to manually download and upload the borrower scenario. Let’s say a lender processes 80 loans per month. Each loan takes about four minutes to enter the information, get rates, and download and upload the information to Encompass. (This doesn’t include having to go back and rekey data for any given scenario either, which would add even more time to the process.) This adds up to 320 minutes of entering in and downloading/uploading that information. However, with our Encompass integration, that same process takes only one minute, and saves the lender three minutes per scenario. When all is said and done, Marksman users who utilize this integration save four hours per month that would otherwise be spent entering the same information again and again, and having to download and upload that information. But by saving themselves that time, they can instead reach out to potential borrowers, nurture relationships, and focus on their business. In addition to our Encompass integration, we feature a variety of other integrations that help our clients on a daily basis – we’re constantly working to provide our users with the best and most relevant tools for them to succeed in an ever-changing industry. We even provide ways to help you find out what tools you could be missing out on, and how you can use them to make your business better. Because, as the mortgage industry moves faster into the digital age, you can’t afford to be behind on the times. If our Encompass integration, or any others are something you that you want to begin utilizing for your business, contact us today. We’d love to show you what our mortgage pricing engine and its many tools and integrations have to offer.